I think this is just a marketing ploy by the pet store. 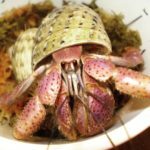 A cheap way for people to get out of buying Instant Ocean, which is what the crabs need and is as close as they’re going to get to real ocean water. crabby33 wrote: I think this is just a marketing ploy by the pet store. A cheap way for people to get out of buying Instant Ocean, which is what the crabs need and is as close as they’re going to get to real ocean water. The people in the pet stores have no control of what products they carry. That is decided at a corporate level. I get imagiterium herit crab saltwater and spring water at the store. I do not believe that Imagitarium is one of the recommended brands of salt water. I am pretty sure it does not contain all the trace elements required by crabs. can you reccomend any brands for me? i want my crabs to get everything they need. thank you very much for bringing this to my attention. purplepincher wrote: can you reccomend any brands for me? i want my crabs to get everything they need. thank you very much for bringing this to my attention. Instant Ocean in the white and purple box for salt water. Prime to treat tap water (use for both salt and fresh water). I dont know what that is, so i will look online for it. does homeade saltwater with sea salt work? i know the recipe. it is used for land and saltwater hermit crabs. i use that a lot, but if i run out i use imagitarium. but no more! i will use the brand you recomend. sorry for the misspelled words i am in a rush. There are other approved brands but I’m not sure which ones. Treat your water with prime then mix 1/2cup of salt mix per gallon. Anything used explicitly for saltwater fish is good for hermits. Anything for reef tanks is also safe, like the Instant Ocean with the orange label. There probably over a dozen brands out there that would work, but the majority are special order or from specialty shops. Instant Ocean seems to be carried in most pet shops. thanks, guys. I will go online and order it soon. you guys are so awesome! again, thank you. my crabs are happy as well. also, I just hand fed acorn, and he wrapped his little legs around the coconut i offered hi and he started eating it! YAY!